If you want a luxurious and exclusive way of getting from A to B, the new BMW 6 Series Gran Turismo Hatchback should be on your shortlist. Bursting with power and housing plenty of space, it’s one of the brands most practical and versatile models. Despite this, it’s lost none of its appetite for style, and although it’s not as sharp as your typical BMW, it still feels and looks as upmarket as you’d expect. Not quite a fully fledged premium SUV, it’s bigger and more spacious than the 5 Series – but it isn’t as fun to drive. OSV takes a closer look at what it’s all about with our 2018 BMW 6 Series Gran Turismo Hatchback review. Make no mistake, this is a pretty big car that needs to be complemented by some serious power. It is, but BMW was also tasked with trying to turn it into one of their ultimate driving machines, too. For once, this is one area where they’ve come up short. If driver involvement is your number one priority, you’d do better taking a look at the 5 Series. As it is, the 6 Series GT’s steering isn’t as responsive as we’re used to from a BMW. Moreover, there’s more body roll than usual, and although the optional variable dampers reduce it a little, it’s still noticeable. Four-way suspension with active roll stabilisation is another optional extra that helps to keep the car level and flat, but you could be here all day adding expensive extras just to get the GT to drive like a BMW. A much better idea is to test drive the 5 Series. As well as great handling, BMW is also known for developing some of the most sophisticated engines around. The petrol range here kicks off with a turbocharged, four-cylinder 2.0-litre engine that powers the 630i model. It develops 254bhp, has a 0-62 time of 6.3 seconds, and maxes out at 155mph. If you fancy that your 6 Series Gran Turismo would benefit from more power, the only other petrol engine is a straight-six, turbocharged 3.0-litre unit that powers the 640i model. xDrive four-wheel-drive is standard, and the engine develops 335bhp and has a 0-62 time of 5.3 seconds. There’s plenty of low-down power available, it’s perfectly paired up with an 8-speed automatic gearbox, and it’s a refined and smooth performer. However, it struggles a bit at higher revs, while some buyers will probably think that the amount of performance on offer is too much for a car like this. It’s also the most expensive model in the range. Enthusiasts might have reason to complain about the way the car handles, but surely no one will have any complaints with its cabin. It’s luxurious, roomy and beautifully put together. Once again with a BMW build quality is second to none, while comfort is first rate. Specify active air suspension and ride quality will be excellent. Insulation is another tick in the box that contributes to a relaxed driving experience. The sports seats come with quality leather trim as standard and the support they offer is superb. They’re heated as standard but if you want a massage function, you’ll need to splash out an extra £800. The dashboard is typical BMW fare – well-built and logically composed. It’s bigger than usual so that it can fit the GT’s vast dimensions, and its fit and finish is excellent. Look around you and you’ll also see evidence of leather, wood and soft-touch plastics, all of which combine to make the cabin feel very special. Is the BMW 6 Series Gran Turismo Hatchback practical? 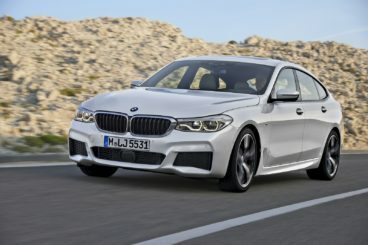 While enthusiasts will look to the 5 Series for driver involvement, those who want more usability will turn to this one. It’s larger and more versatile. There are lots of storage spaces dotted around the place, access to the rear seats is easy and once they’re belted up back there, passengers will be pleased with the amount of space on offer. Visibility is another plus, while the boot comes in at 570-litres. This can be increased to 1,700-litres by folding the rear seats. All models are well-equipped, with standard kit including a rear view parking camera, a powered boot lid, dual-zone climate control, power-adjusted heated seats, LED headlights, LED fog lights, cruise control, front and rear parking sensors, a 20GB hard drive, cruise control, BMW’s iDrive infotainment system, a digital radio, sat-nav and adjustable ambient lighting. Also standard is the brands excellent ConnectedDrive Services, which gives you access to Apple CarPlay, BMW’s concierge services and more. In terms of how safe the car is, Euro NCAP awarded it all five stars for its crash-test performance, while its standard safety kit includes the aforementioned ConnectedDrive Services, automatic emergency braking, all-around LED lights, traffic info and Emergency Call. Prices for the new car start out from £47,925 and rise to £58,835. For more information on our leasing deals, you can check out our page here. In terms of its running costs, there are two petrol engines available, the cheapest of which to buy is the 530i model. It averages 43.3mpg economy if you stick to the 18” alloys, which doesn’t seem half bad for a car that can sprint from 0-62mph in 6.3 seconds. The 640i, straight-six engine develops 335bhp and returns 35.3mpg at best while pumping out 187g/km of CO2. It’s expensive to insure and sits in group 43, while the smaller 630i model sits in group 41. Its 570-litre boot is a clear highlight, especially when you consider this is a car that can do 0-62 in 5.3 seconds. Both petrol engines offer the kind of brisk performance needed to haul this car comfortably along on a full load. It’s refined and suits the car well. The 640i gets four-wheel-drive as standard and is a highly capable engine, but returns of 35.3mpg aren’t attractive. There are sharper BMWs, both in terms of looks and drivability. Let’s see how the car fares against its rivals in the comparison section of our 2018 BMW 6 Series Gran Turismo Hatchback review. 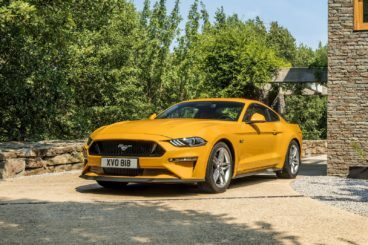 The brand new Ford Mustang GT is a tweaked version of the iconic Mustang that Ford hope will be better suited to European roads than the original. Power comes from a V8 petrol engine that develops 444bhp and 4,600rpm. The engine is paired up with a 10-speed automatic gearbox, the car has a 0-62 time of just 4.0 seconds, while fuel economy is pegged at 23.3mpg. Emissions, meanwhile, stand at 270g/km of CO2. It’s a hefty car that’s built like an NFL player but it’s as fast as its numbers suggest. In fact, Ford has improved its peak acceleration and the automatic ‘box suits it well. All you need to do is hammer the accelerator and look on as the 10-speed auto surges through the ratios. That said, we can’t help but think its 0-62 time of 4.0 seconds might be too optimistic, especially on a dry day. It’s still a fast car, of course. Another contentious point is the 10-speed gearbox. The idea of that many speeds mated to a V8 Mustang will strike some as odd but there’s no doubting that the Mustang’s V8 engine holds plenty of appeal. The steering and suspension setups have been refined, handling is good and there’s now less body lean than last time. 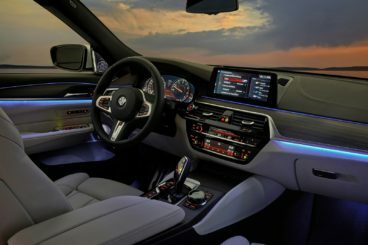 Inside, the cabin is made up of a few upmarket materials than usual, and we think buyers will like the new 12” digital instrument screen. It can’t rival equivalent screens in rivals – including the BMW – but it makes the Mustang look more premium than last time. Is the Ford Mustang GT practical? It’s got just the three doors and adults will be a bit uncomfortable in the rear, especially on longer trips. Indeed, only kids will enjoy themselves back there. Space up front is mostly fine but elbow room is a bit of an issue, thanks to the fact that the centre console is positioned with American buyers in mind. The boot, meanwhile, measures 408-litres. 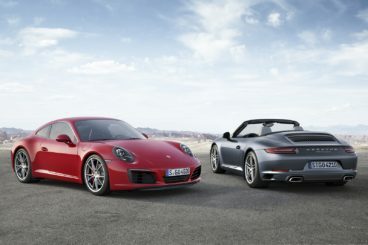 The new Porsche 911 Carrera GTS is arguably the pick of the 911 Coupe range. It has more focus and power than the standard model and convinces as an all-rounder. Its flat-six, turbocharged 3.0-litre engine develops 444bhp, has 550Nm of torque available, and boasts a 0-62 time of just 3.7 seconds if you pair it up with a 7-speed PDK dual-clutch automatic ‘box. Adding four-wheel-drive meanwhile slashes that time down to 3.6 seconds. The GTS is lower than the standard model and this gives it more balance and poise, and it also improves the way it handles. It’s not quite as driver-focused as the GT3 variant, but it isn’t far off. The GTS comes with Porsche Stability Management as standard, a system which monitors the Carrera so that individual wheels can brake strategically. Porsche Active Suspension Management is standard too, a system that’s constantly adjusting the ride’s firmness to suit the road surface. There’s a pleasing amount of traction available too, which gives you confidence, and overall, it’s a rewarding sports car to drive. Running costs? The best it can manage is returns of 33.2mpg, which doesn’t seem half-bad for a car like this. Emissions, meanwhile, are at 192g/km of CO2. Inside, the driver’s seat is set low which gives the car a sporty flavour. Make no mistake, though, the seat is very low, but it comes with plenty of adjustability so that you can get as comfortable as possible. In terms of design and quality, there isn’t much to criticise. There are a lot of buttons on the dash, but things aren’t too confusing and the arrangement is fairly logical. Some buyers, however, might question the lack of design flair. The Carrera GTS comes with a brand new infotainment system that, due to the sheer amount of buttons, runs the risk of being a tad confusing to use at first. The graphics are easy enough to figure out, however, and the functions are simple to use. Thanks to the Porsche Active Suspension Management system, the car is comfortable and insulation is okay. Engine and wind noise is well suppressed, but tyre noise roars in. Is the Porsche 911 Carrera GTS practical? Practicality is hardly the first thing you’ll be thinking of when weighing one of these up, but it’s got a reasonably-sized boot, a 2+2 layout and visibility are excellent. For a car of this type, it’s pretty damn usable and small children will love it. Pace, power and practicality – this BMW seems to have it all on paper. However, bringing it all together in the real world is a different story. The car struggles with the burden of high running costs, while its styling and the way it drives lack BMW’s usual sharpness. The new BMW 6 Series Gran Turismo Hatchback is a good car, but not a great one. ARE YOU INTERESTED IN GETTING A Coupe 4dr?